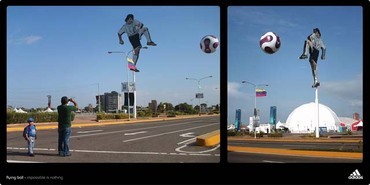 Adidas, this time in Venezuela, taking their campaign line very literally for the Copa Americana. Neither of these campaigns are new, but both of them caught my attention at the time and this week they have both won FIAP awards for media innovation. 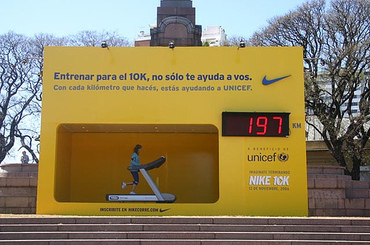 Both for Nike and both by BBDO Argentina, in response to the need to localise what are global campaigns: the Nike 10k and Nike Football. Barrio Bonito, winner of the Gold Grand Prix, is an Argentina-friendly response to 'Joga Bonito' (the beautiful game), which was too obviously Brazilian to sit well with Argentine football fans. 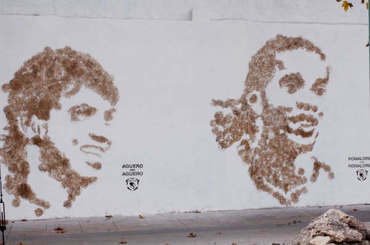 BBDO took over part of La Boca, the home town for the most popular football team, and created a sort of interactive 'shrine' to the great players that extended over a couple of blocks. Here's a link to a video case study in English. 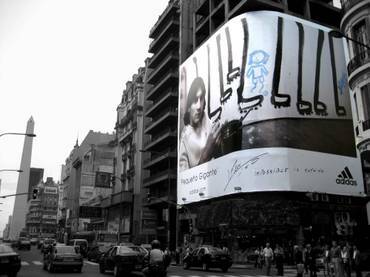 Adidas have launched an outdoor campaign that amplifies its current TV creative in Buenos Aires. They have attempted to match the media strategy with the campaign line by erecting the largest billboard in South America. It's 29m by 18.2m. Unfortunately it is slightly dwarfed by being placed on the widest street in South America, wrapped around a tall building, near the tall obelisk.